Summary The MPrin of technical debt left in place can increase or decrease, even if the artifacts that comprise the technical debt don’t change. This variability can be exploited to advantage in some rare cases. Most often, though, the MPrin increases with time. That’s why it’s risky to leave a technical debt in place under the assumption that its MPrin is fixed. Recall that our definition of the metaphorical principal of a technical debt at a given time is the cost of retiring the debt at that time. This cost can change with time. For example, due to subsequent maintenance and enhancements, the part of the asset in which the debt is embedded might become rather more complicated or constrained than it was earlier, even if the elements that comprise the debt itself have remained unchanged. Moreover, any extensions to the asset in question, or to other assets, that use services provided by subsystem manifesting the debt might also require alteration at debt retirement time. Untangling the debt from its surroundings, making necessary modifications, and testing the result, can be a delicate and complex process that actually costs more at debt retirement time than whatever was saved when the debt was incurred. On the other hand, in some circumstances, the cost of retiring the debt can decrease over time. Consider the following fictitious example. A high pressure sodium streetlight at dusk. Photo (cc) Famartin courtesy Wikimedia Commons. Zion is a small city of 110,000 that’s struggling with two problems related to street lighting. 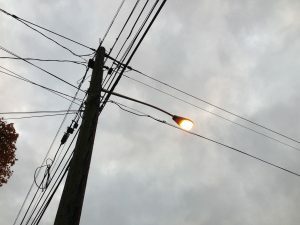 Its current streetlights use High-Pressure Sodium (HPS) lights, which use almost twice as much energy as do the newer LED streetlights for the same level of illumination. Zion’s second problem is that the existing streetlights provide only one level of illumination throughout the city. This is causing a stream of complaints from many residents who have concerns about street lighting spilling onto their property at night. The bright light interferes with the sleep patterns of people and their pets. Because both of these problems have technical solutions that became available after the current HPS lights were installed, they can be viewed as arising from technical debt. Zion had investigated resolving the light pollution problem, but could not find a solution it could afford. Time passed. When LED street lights became widely available, Zion investigated retiring its HPS lights, and found an LED lighting system that was dimmable on a block-by-block basis using a wireless control system. By retiring the technical debt associated with the HPS lights, Zion was able to afford retiring the technical debt associated with its one-size-fits-all un-dimmable lighting system. Zion was able to afford to retire both forms of technical debt at once because of the way they interacted, even though retiring them one at a time would have been too expensive. This example shows that the MPrin of a technical debt can vary widely, depending on the assets involved, and on what other debts they carry. Such variation is far more common in the realm of technical debt than it is in the world of financial debt.